For the 2006 prequel, see Grand Theft Auto: Vice City Stories. Grand Theft Auto: Vice City is a non-linear driving and shooting game released by Rockstar North on October 27, 2002 for the PlayStation 2 and May 12, 2003 for Windows, as well as in November 2003 for the Xbox in the Grand Theft Auto Double Pack re-release along with Grand Theft Auto III. As the title implies, the game involves an amount of crime and plenty of carjacking. 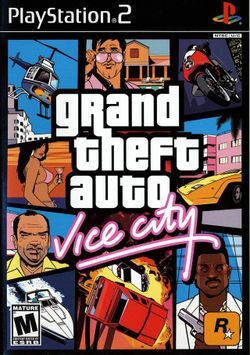 The game takes place in 1986, when player character and protagonist Tommy Vercetti is released from prison and dispatched by Sonny Forelli, head of the Forelli Mafia family in Liberty City, to Vice City for the establishment of a narcotics deal. Unfortunately, as the deal was almost complete, gunmen attack the meeting and kill several other men, while Tommy flees, leaving the drugs and the Forelli-supplied money behind. Together with lawyer Ken Rosenberg and with no money, Tommy is forced to find the party responsible for the attack, and eventually seize power of the city. You, the player, will take the role of Tommy Vercetti after he arrives in Vice City. This page was last edited on 16 August 2016, at 14:03. This page has been accessed 103,608 times.